The HD DVD edition of 'Ocean's Twelve' is identical to the version that was included in the 'Ocean's Trilogy Giftset' released in November of 2007. Fans who already own the trilogy box-set won't find any upgrades or improvements on this disc. In 2001, indie wunderkind Stephen Soderbergh released his pulpy heist classic 'Ocean's Eleven' to rave reviews and more than $450 million in worldwide ticket sales. Alas, his inevitable sequel, ‘Ocean’s Twelve,’ was critically crucified, tied to Entertainment Weekly’s chariot, and dragged in the mud until it was unrecognizable. Lucky for me, I’m still able to enjoy a sequel even if it doesn’t live up to the original. Sure, Soderbergh’s second heist never reaches the heights of his crew’s first outing, but it still manages to stand out from the majority of modern heist films on the market. 'Ocean's Twelve' takes the ragtag team from ‘Ocean’s Eleven’ out of Vegas and sets them loose in Paris, Amsterdam, and Rome. Three years after their successful triple-casino robbery, a vengeful Terry Benedict (Andy Garcia) tracks down the crew and forces them to earn back his stolen loot (plus interest). Doing what they do best, the team focuses on a series of intricate heists to reach their fundraising goals, but it won't be so easy this time, as they have to contend with a rival thief (Vincent Cassel), a feisty agent of the law (Catherine Zeta-Jones), and a reluctant new team member. ’Ocean’s Twelve’ was physically assaulted by critics upon its theatrical release in 2004 and, to an extent, I agree with the majority of their complaints. Although it brims with the same sort of wisecracking shenanigans as its predecessor, this sequel has a vastly different tone, one that sometimes loses its focus due to an endless number of subplots and plot twists. That being said, there's still a lot to enjoy in 'Ocean's Twelve'-- by my estimation, it isn't nearly as bad as many critics have made it out to be. Brad Pitt and Matt Damon sink their teeth into more centralized roles, with their clever banter with Clooney remaining as kinetic as ever. Better still, a series of larger-than-life opponents toy with each criminal and give the team a genuine challenge, even as they struggle with the difficulties of their lifestyles and face the consequences of their actions. The endgame may not be as strong as the vault robbery in 'Ocean's Eleven,' but Soderbergh still has plenty of aces up his sleeve. I'll be the first to admit that 'Ocean's Twelve' isn't perfect. It visibly struggles to rekindle the fire of ‘Eleven’ and it has a hard time with the change in scenery. Still, clever characters and witty dialogue are the real draw here and, on that level, the sequel is quite consistent. I still enjoyed watching Soderbergh’s crew of first-rate actors having a ball. If you can turn off the overly critical portion of your brain, I’ll bet you'll find plenty of things to love scattered throughout this critically-panned sequel. 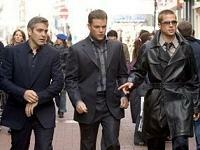 'Ocean's Twelve' features a 1080p/VC-1 transfer that offers the worst visual experience of the trilogy. While it occasionally maintains the bright contrast of ‘Ocean’s Eleven,’ it relinquishes the first film’s crisp detailing and image depth. Soderbergh intentionally submerges the film in heavy, crushed shadows that strip faces and locations of the high definition pop I look for on every Blu-ray release. Noise is more aggressive this time around -- in some scenes I actually had trouble telling whether I was seeing heavy grain, digital noise, or some sort of technical deficiency on the disc. The transfer may have Soderbergh’s approval, but I have to say, it isn’t my flavor. Compared to the standard DVD, this transfer merely offers a fundamental upgrade. 'Ocean's Twelve' sounds much better than it looks, in spite of the fact that it only include a standard Dolby Digital Plus 5.1 surround track (identical to the Blu-ray at 640kbps). Like the other entries in the trilogy, Soderbergh's second shot at the heist genre is largely a conversation driven experience that doesn't offer many "wow" moments. Thankfully, dialogue is always crisp and nicely prioritized despite the fact that the soundfield is anchored to the front channels. There are a few, intentionally hushed lines that are difficult to decipher, but they rightfully add to the mystique of the plot rather than distracting as a technical deficiency of the track. Like 'Eleven' and 'Thirteen,' the most exciting element of the mix is the score and soundtrack. Evolving to incorporate its jazzy riffs with international flavors of music, 'Ocean's Twelve' features the most diverse soundtrack of the trilogy. Heavy strings, a variety of percussive beats, and the ever-present horns live up to their potential. Unfortunately, the mix rarely take advantage of the rear soundstage, leaving the crowded streets of Europe sounding distinctly sparse. Ambiance isn't a priority and the sound designers apparently weren't tasked with creating an immersive track. Dynamics are a bit more impressive than in 'Eleven' or 'Thirteen,' but the increased LFE presence fails to make the experience stand out from the rest of the trilogy. Make no mistake, the DD+ mix handles everything Soderbergh throws its way with relative ease -- it just fails to pack the same punch as better high-def releases. Like its standard DVD counterpart, 'Ocean's Twelve' doesn't include any non-exclusive special features save a collection of trailers. 'Ocean's Twelve' was skewered by critics and audiences who were expecting Soderbergh to top the inventiveness of 'Ocean's Eleven.' I don't think the results are nearly as deplorable as others have stated, but I can definitely understand the roots of their disappointment. The HD DVD edition of 'Twelve' provides a middle-of-the-road experience as well. Its faithful but problematic video transfer, suitable audio track, and decent collection of supplements never seal the deal. Give this one a rent and decide for yourself.